Left of the Dot Media is now Left. We are Left – just one word, but it has so much meaning! Imagine if you could do the impossible. Imagine if you were free to soar high with unrestrained opportunity. Imagine if you could make your mark, play with your family, and impact your Community in ways never before imaginable. The kite flies because of its tail, meaning those little things we do every day – they matter. They matter more than you know. Imagine if… we were Left. After an incredible five-and-a-half years operating as Left of the Dot Media, we are now rebranding to Left™. It is just one word, but it carries with it a whole lot of meaning. So why the change, why now? A big factor in the rebrand was to more accurately reflect today’s reality that we have pivoted away from a business model where we had domains at our core (and really from building out sub-domains ‘to the left of the dot’ which was our original business concept). Today, Left’s core is our people, and the left-field, left-brain, road-less-traveled, innovative ideas that these people can create. Yes, we build businesses. Great businesses. But Left is more than just a media company; it is more than the sum of its parts. We believe that everything and anything is possible. We believe that a company can make great, profitable businesses without sacrificing the joy in life. We believe that making our mark on the world, taking care of our families, and impacting our Community positively is the foundation to building incredible things. Our values are not just things that we believe in, they are the way we do our jobs, live our lives, and engage with the world around us. We have been working hard to create a brand that we can all be proud of… one that we will place joyfully onto everything we do and onto everything we create: from apparel, to the side of our office buildings, and all points in between. The brand features a custom font and symbolism throughout. We wanted a logo that had a certain vibrancy to it, one that reflected our cultures and core values. We wanted the brand to feel alive and be symbolic of the creativity and innovation that is at the heart of what we do. We wanted it to show connection and movement. I think this has been achieved. Look at the ‘’L”… your eye moves from left to right quickly, following a continuous line that runs through the entire brand. This line shows movement and represents the ten core values that bind us. Next is the “e”… this is inspired by Google, and the same letter is in their word mark. We were inspired by them, not because of the traffic that they generate for many of our brands, but because like Google, we wanted to add a bit more playfulness to the mark (and we also admire their innovative style). We like to have fun and do things a little differently, so we didn’t want to have just a regular old ‘e’. Our ‘e’ leans leftward, but still looks like it is gaining momentum, rolling forward. Then comes the ‘f’ and ‘t’. These are connected. We had looked at potential acronyms in our branding exercise, and while we couldn’t agree on what the first two letters would represent, we do believe the last two were symbolic of ‘Family’ and ‘Team’. The fact that they are connected is kind of like what we do. We like to think of them as holding hands. We have always had kites on display in our offices, watching over us in a way. The ones above the desks of our employees today were flown by our first Lefties on their first day in the office. When Chris and I were first writing out the projects we had in front of us, we scribbled diamonds on the wall and wrote the big projects. Beneath these, we had small rectangles listing all of the sub-tasks we needed to do to achieve these tasks. We created kites. In our last office, we had an old Hawaiian proverb on the wall reminding everyone, “The kite flies because of its tail.” In tech companies, you often have the metaphor of rocks and pebbles where rocks are the big projects and pebbles are the small tasks. We liked the symbolism of a kite way more than that of a rock. A rock is about looking down. A kite is about looking up. There are many more possibilities in life and in business when you keep your head up and you look around and marvel at the world. A kite is playful. We want to enjoy what we do. We need to take time to play games and appreciate life. If we don’t, what’s the point? A kite flies in the blue sky. You can control it, you can pull the string, but in the end if you let go, it will fly for a while before falling back down to earth. A kite needs attention. The kite’s tail forms a stylized ‘L’. As a result, our hope is that it can eventually stand alone as a mark. The kite’s colour was inspired by the lights we used to have on our first few desks: the warm glow of a green banker’s lamp. When looking at the colour, we wanted it to be bright enough that it, alone, would show the vibrancy and life of the team and company. We have had a great 5.5 years as Left of the Dot, a brand that had served us well and saw a lot of excitement. But you know what’s really exciting? Imagining what’s left to come. We have a lot of string left to be let out. 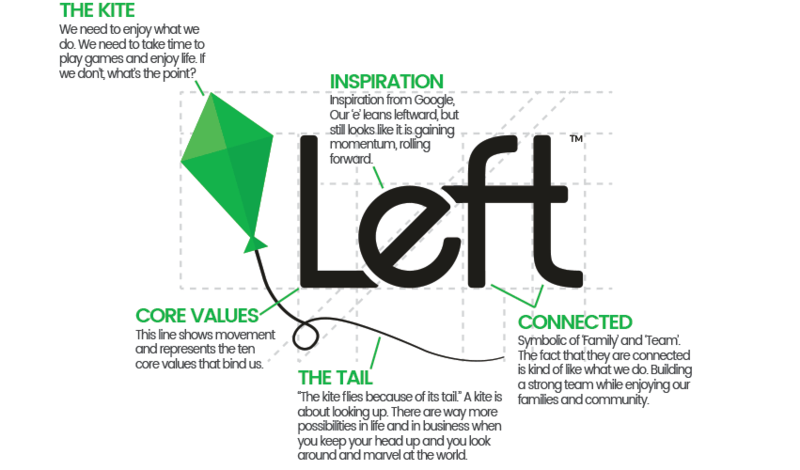 The new Left brand was created by the incredibly-talented Joe Deobald, our Creative Director, and principal at Full Frame Marketing. Joe was one of our original Lefties, and he was there working with us at the very beginning (even before there were any Lefties, in fact). Several years ago when we didn’t have enough work for a full-time creative team, we formed a unique partnership with Full Frame. Left of the Dot would be their largest client, and we would incubate their design and branding team out of our offices, which they still call home to today. Since that time, we have built many award-winning brands together. And while we look forward to our ongoing collaborations, it gives us immense satisfaction to see his agency take flight.